The Capitol | After the Fire | Style Weekly - Richmond, VA local news, arts, and events. The Capitol as it appeared at the end of the Civil War before the front steps and legislative wings were added. Today, since the addition of its 20th-century legislative wings and 21st -century underground reception area, the Virginia Capitol is much larger than it was during the Civil War. But the Thomas Jefferson-designed, 1788 Roman templelike structure was an unrivaled Richmond icon at the time of the Civil War. When the Prince of Wales, later British King Edward VII, visited here in 1860 he was driven by carriage to Hollywood Cemetery (still largely undeveloped) for its panoramic views of the statehouse. The prince was also ushered inside the capitol to see the George Washington statue by French sculptor Jean Antoine Houdon. 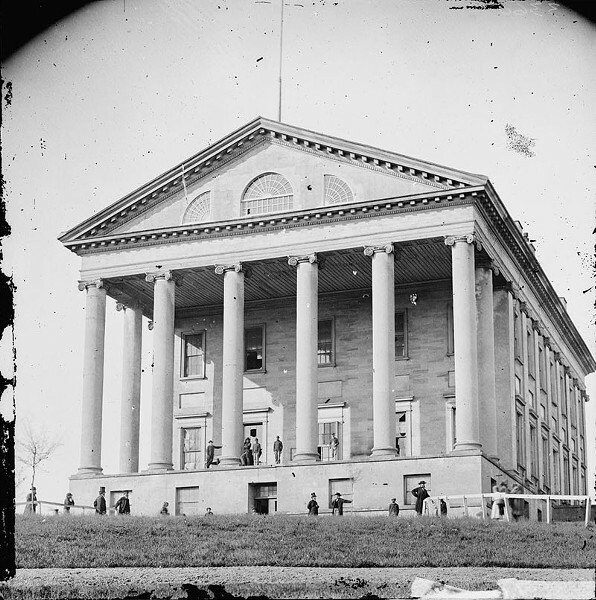 During the Civil War the Confederate Congress met in the building's House of Delegates chamber. 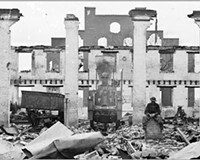 On April 4, 1865, just days after the evacuation fire, President Abraham Lincoln and his son Tad visited the former Confederate capitol. In the weeks immediately after the fall of Richmond, the House of Delegates chamber became the headquarters of the Union's 25th Corps which had control temporarily of the city. Today, that room is mostly a shrine to the building’s Confederate legacy and houses busts and statues of officials such as Confederate President Jefferson Davis, Vice President Alexander Stephens, Robert E. Lee, Matthew Fontaine Maury, Gen. Joseph Johnston and Gen. Thomas "Stonewall" Jackson.